These commercial roll laminators are designed for use in print shops, sign shops, print-for-pay operations and inside corporations that need to produce their own high quality laminated or mounted output. Commercial roll laminators often include features such as gapped rollers, higher speeds, fully adjustable speed and temperature settings and the ability to handle larger film core sizes such as 2.25" or 3". These are features that are simply not available on lower cost school units. However, these commercial laminators are all less than 44" in width. If you need a wider laminator you might want to check out our wide format laminators section. Take a look and give us a call if you have any questions. Supply Roll Core Size: 1"
Welcome to MyBinding video. 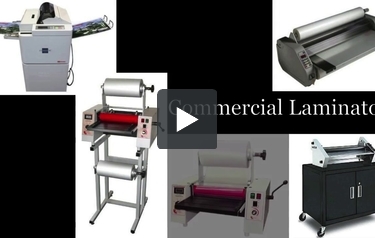 These commercial roll laminators are designed for use in print shops, sign shops, print-for-pay operations and inside corporations that need to produce their own high-quality laminated or mounted output. Commercial roll laminators often include features, such as gapable rollers, high-speed operations, fully adjustable speed and temperature and the ability to handle larger film core sizes such as 2.25” or 3 “. These features are simply not available on most school laminators. However, these commercial laminators are all less than 44” in width. If you need a wider laminator, you might want to check out our wide-format laminator section. All in all we, have a fantastic selection. We have a dedicated call team to answer your questions and guide you through every process that you might need. So give us a call or click, we want to be your source. When image matters, MyBinding.